The fine margins between success and failure at National League level were emphasised on Saturday as Leamington stretched their unbeaten run to seven games, writes Paul Okey. In truth, there was little between the sides but a deflected strike and two penalties illustrated the difference between a side rock-bottom and out of luck and one riding the crest of the wave after taking five points from Salford, York and Harrogate. Indeed, Villagers keeper Ross Durrant barely had anything to do apart from pick the ball out of the net three times. The first came just seven minutes in following a shapeless opening, Jack Edwards’ close-range strike hitting Stephen Brogan and looping up past Durrant after the visitors had failed to deal with a Kurtis Revan long throw. Ross Barrows’ strike from a narrow angle was straight at Tony Breeden as Ferriby looked to respond, while Connor Gudger rippled the side netting at the other end with a free-kick. However, with both sides struggling to judge the wind, even those who paid a small amount as part of the Pay What You Want offer were struggling to get their money’s worth. The monotony was briefly lifted on the half-hour when the pace of Revan drew a foul from Jake Skelton on the byline, with Rob Thompson-Brown stepping up to send Durrant the wrong way from the spot. A Ferriby free-kick in injury time elicited the first moment of panic in the home box, with Breeden failing to claim it under pressure. However, Curtis Bateson’s eventual cross-shot slid past the angle. Ten minutes into the second half it was game over. Again it was Revan’s pace which was the catalyst, the striker wrong-footing his marker and then bursting into the box before tumbling to the ground under pressure from Jordan Cooke. Thompson-Brown again took the responsibility from the spot and although Durrant guessed right, the ball found the back of the net via his hand and the right-hand post. With the points seemingly wrapped up, Brakes eased off, allowing the Villagers, with the wind at their backs, to enjoy the better of the second period. A Barrows shot deflected off Jamie Hood for a corner, while Breeden had to be alert to claim possession ahead of Kuda Muskwe after the keeper’s clearance was quickly returned by Skelton. A deflected Stephen Brogan shot drew a fine reaction save from Breeden who was then grateful to a superb last-ditch clearance from James Mace as Muskwe looked set to fire home the rebound. 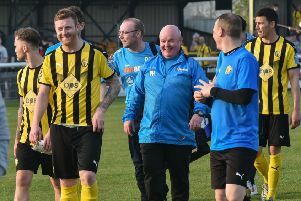 Brakes boss Paul Holleran took the opportunity to ring the changes, with Joe Magunda, Richard Taundry and Colby Bishop joining the action in place of Jack Edwards, who was struggling with a knock, Liam Canavan and Revan. The fresh blood did little to alter the pattern of play, with Bateson firing straight into the hands of Breeden after the hosts struggled to clear, the midfielder clearly believing a push in the back had affected his aim. Darnell Bailey-King, whose arrival had pepped up the visitors’ attack, then drew a point-blank save from Breeden after getting on the end of Barrows’ header on. The Villagers had ambitious claims for a late consolation after a Brogan corner caught on the wind and was claimed by a back-pedalling Breeden on the line before Leamington were roused for a late flourish. Thompson-Brown got too much purchase on a shot from the edge of the box after neat build-up play involving Callum Gittings and Connor Gudger, while Bishop was unable to guide a flicked header on target. Bishop then got into a good position but his shot was much like the game, tame. Not that Leamington will be complaining, with a seventh game without defeat meaning they are now closer to the play-off positions than the bottom three, albeit again by a fine margin. Brakes: Tony Breeden, James Mace, Connor Gudger, Callum Gittings, Jamie Hood, Junior English, Kieran Dunbar, Jack Edwards (Joe Magunda, 70), Kurtis Revan (Colby Bishop, 77), Liam Canavan (Richard Taundry, 70), Rob Thompson-Brown. Subs not used: Stefan Moore, Matt Hill. North Ferriby United: Ross Durrant, Ross Barrows, Stephen Brogan, Russ Fry (Mitchell Langton, 77), Jordan Cooke, Jake Skelton, Simon Russell, Curtis Bateson, Kuda Muskwe, Joel Ambalu (Jake Picton, 69), Callum Rzonca (Darnell Bailey-King, 60). Subs not used: Mark Gray, Yannick Gomes.